Golden, Colorado (August 13, 2012) – An ultraviolet (UV) multispectral imaging (MSI) system is now available from Ocean Thin Films. 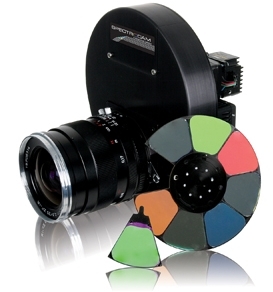 The SpectroCam™-UV multispectral imaging camera provides sensitive detection from the UV across the visible spectrum and into the near-IR. The SpectroCam-UV is a powerful tool for high level research. SpectroCam is the world’s first fully configurable, video-speed MSI camera. With eight interchangeable, customer defined filters, users can test many filter options, in combination with the powerful image processing software, to greatly reduce development times and speed products to market. SpectroCam makes multispectral imaging accessible to everybody from university researchers to high volume OEM equipment makers. To accommodate an even wider scope of applications, the new SpectroCam-UV’s sensor range has been extended into the UV and can be paired with filters available throughout the UVA, UVB and UVC wavelengths. In addition to the camera, Ocean Thin Films offers turnkey UV imaging packages that include UV-compatible optics and light sources. With a full range of standard filter wavelengths, and the ability to create custom optical filters to meet application needs, Ocean Thin Films provides the right instrument to support a wide array of applications. The SpectroCam family of cameras offers the most flexible and powerful imaging tools for biomedical, forensic, agricultural, industrial and surveillance applications.